The Weslo 50SE treadmill is the most advanced machine in the company’s line of budget treadmills. It’s priced at just under $500, which is actually somewhat of a no-man’s land for treadmills, that is, the money is substantial, a real “investment”, yet the Weslo 50SE is at the bottom rung in terms of treadmill quality. As the saying goes, you get what you pay for, and buying a treadmill because you got a good price on it, is the worst reason to buy one. If the machine doesn’t offer the quality and reliability you really need in order to have regular workouts, you’re wasting your money. UPDATE: The Weslo Cadence 50 SE is no longer available. 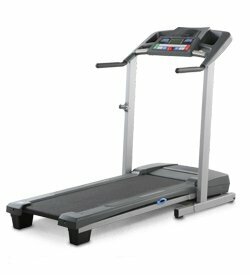 Check out the full lineup of Weslo treadmills at reduced prices here. The Weslo 50SE treadmill comes with lots of bells and whistles for a budget (under $500) treadmill, features you normally see on models costing $1000 and up. Among these features are things like a 10 mph max speed, power incline, advanced deck cushioning to lessen the impact on the joints, dual grip pulse monitors, and pre-programmed workouts on a large LCD display. Nice features, but the durability of the Weslo brand is problematic. Owners of the Weslo 50SE report the belt to be a bit too narrow and short, so you’ll need to stay focused on your workout, or else you’ll step on the front or sides which could throw you off balance. Otherwise, if your plan is to hop on a treadmill and push “Start” and just do it, this might actually work for you. Compared with other manufacturers’ machines, it’s hard to be a fan of any of Weslo treadmills, but the 50SE does have a few more pros than cons. Good treadmills are expensive, complex machines. They’ve got computers, motors, rollers, they're heavy, and they take up space. But for many a home fitness buff, they are machines they simply won’t live without. 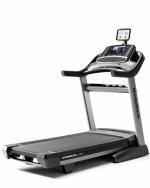 Weslo is the “bargain basement” treadmill brand and while this model isn’t exactly a show piece, for the affordable price and with casual use the Weslo 50SE treadmill should hold up for a couple of years until you can move up to a better-built treadmill.